Out of crisis comes creativity. I've been in crisis for sometime now. Without getting into too much detail, let's just say that just because your child is technically an adult doesn't mean you stop worrying and/or parenting (though more hands off) while they navigate through some catastrophic decisions that reverberate through the rest of your family. I am living this "dream" (nightmare) right now, but my poetry, this blog, and most especially, the Poetry Friday community, have given me solace. To take my mind off my heartache I have put my energy into creating something heartfelt, something helpful, and hopefully something humorous. I have become a Poetrepreneur. 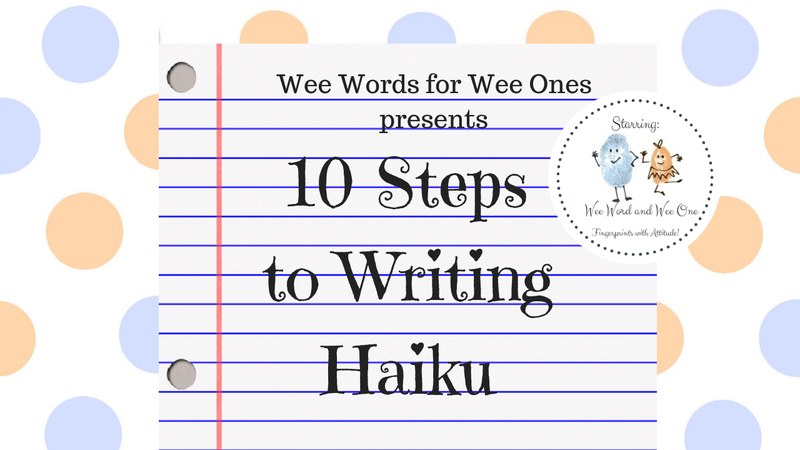 Tapping into my background as a former Elementary Teacher and School Librarian coupled with my MFA in Writing for Children and Young Adults, I have created a series of How-To-Write poetry videos and companion handbooks. 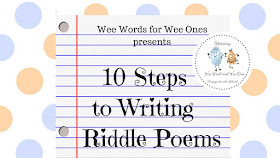 Today I present to you my first video: 10 Steps to Writing Riddle Poems. Please let me know what you think: the good, the bad, and the ugly. I value your feedback and I appreciate your insights. 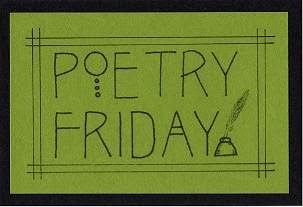 Poetry Friday fun can be found at Dori Reads! Join us! Your little characters are adorable, and I really like the background you're using. The lesson and music are good. The only suggestion I have is to make a shorter version for people who really want something quick. Last year when I was looking for poetry and biography videos for the school's morning news show, I needed ones that were two minutes or less. Not that you should make them THAT short, but ones of varying length can reach additional audiences. Just a thought! Bridget, you are so clever. I love both versions, and see that teachers who use videos with their students would take this to use in beginning poetry. I've done riddle poems with young students and they do love them, so it's a great "first" lesson. Your little thumbprint figures are delightful, will help hold the attention. I'll share on FB for those teachers just starting their year! Here's a hug for the challenges you're facing, not easy as a parent I know. Best of wishes to you as you work through the hard parts. Thank you SO much, Linda, for being such a supportive friend and spreading the word. I know I have work to do on the video, but hopefully many teachers (and their students!) will find each video and handbook in the series helpful. Hi Bridget, Sympathy for the crisis. I hope something good comes of it in the long run, however long it takes. I watched your video. I love it, especially the humor. Lots of good stuff there. I only had a couple of ideas. Instead of using "Answer" you could use "Example" to suggest that the watcher will want their own idea. Also, toward the end, some of the comments by your adorable thumbprints flashed by me too fast for me to read them. Voiceovers might be good. Or you could make them hang there a bit longer. A truly great idea!! Woohoo! 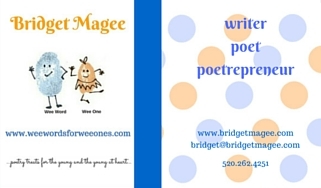 Congrats on your Poetrepreneur launch, Bridget!!! I can totally see these videos being used in the classroom or for homeschooling. 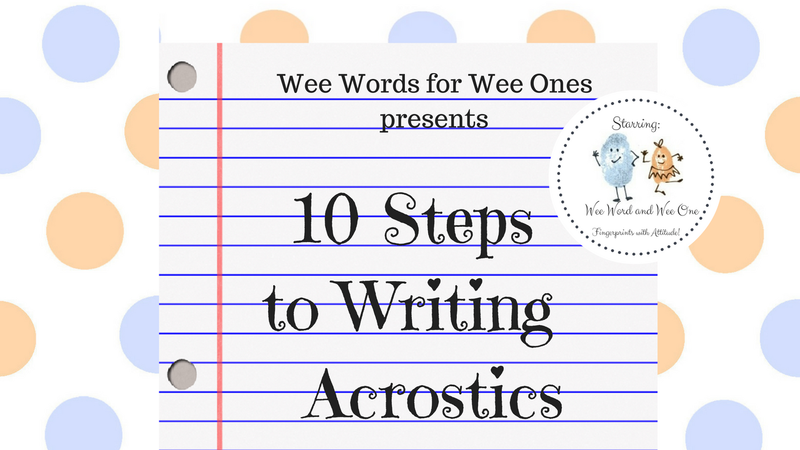 I loved your Wee Word and Wee One characters– they're great for grabbing and keeping interest. 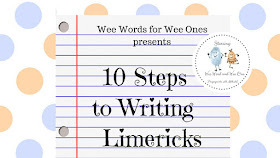 I agree with Brenda that sometimes the wee commentary flew by a bit too quickly, though, and maybe you should consider adding voice overs for parts of it like the steps and reading of the poem. I also noticed at one point you wrote POV– I would spell out "point of view." Also, the video ended a bit abruptly, I wonder if you could fade it out with the music instead of cutting it off? It just makes it a bit more polished. But other than these few minor suggestions, I think it's woweewowwowwow!!! PS. Hang in there with the family stuff! Thank you SO much, Michelle, for your enthusiastic support. I love your spot on feedback. Looking forward to making my edits and making this video (and the others in the series) better thanks to poets like YOU! Great instruction, Bridget! I'm so impressed. Your directions are clear and easy to follow. I love the wee characters commenting and their cute jokes. They really lightens things up. Is there any way you could give the typewriter sound a little less volume. It seemed intrusive at first, though by the end, I found was tuning it out. Bridget, what an wonderful idea. And you've done such good work with this. I did't get all the way through, for some reason my browser got hung up and wouldn't finish the video. But I did like what I was able to see. Love your new word. And having somewhere to direct your thoughts rather than letting them become toxic during this stressful season is good medicine. What a great resource for teachers, Bridget. Thanks for sharing it. I can't wait to hear more about how your project develops. I'm so sorry that your family is dealing with a crisis right now. I hope things get easier soon. Parenting is not for the faint of heart. Hugs to you about parenting an adult child...unfortunately I know too well about that. It doesn't end. But good for you for putting your energies in your poetrepreneur videos!